Welcome back to Red Pen Tidbits! I introduced this new series last week with an overview about grammar and usage. Every first and third Thursday of the month we’ll look a little closer at some aspect of grammar or usage. This week, we’ll check out apostrophes! I don’t know about you, but sometimes when I write, an apostrophe tries to sneak into place’s places it doesn’t belong. The pesky little punctuation mark is even more problematic when it comes to words that end in -s (especially if they’re plural). What in the world is an apostrophe? So, let’s start with contractions! Contractions are formed when you smoosh two (or more) words together and omit letters in the process. You use an apostrophe to represent the missing letters. – He’s (he is) not the villain in the story. – When we finish our class, let’s (let us) go to the movies. —– NOTE: let’s not lets — this is a common error for some writers. – She lied to her mom when she should’ve (should have) told the truth. —– NOTE: have not of — this is also a common error for some writers. – Although he didn’t (did not) have any money, he still made an excellent present. —– NOTE: didn’t not did’nt — one more common error for some writers. Wait! You said two or more words! I want an example of more… pretty please? – I shouldn’t’ve (should not have) left the kids alone with makeup for ten minutes. – He oughtn’t’ve (ought not have) asked that question based on the teacher’s expression. NOTE: If you simply separate the words and add the letters back, you can see if an apostrophe should or shouldn’t (should not) go there. Can I ever break this rule? No. These are simply the singular form of nouns (not pronouns) showing possession (ownership or membership). They end in an apostrophe plus -s (‘s) even when the word ends with an -s.
—- NOTE: When more than one person owns a single item, the apostrophe plus -s goes after the last person named. NOTE: Possessive nouns are followed by what they possess. Double-check to see if you are meaning possession or simply trying to make a noun plural. Can I ever break this rule? YES (times two)! 1. Some writers say you can leave off the -s after the apostrophe if the singular word already ends in an -s. Either way is accepted, but be consistent. 2. If the “owner” is an inanimate object, then you don’t use the -‘s. These are simply the plural form of nouns (not pronouns) showing possession (ownership or membership). 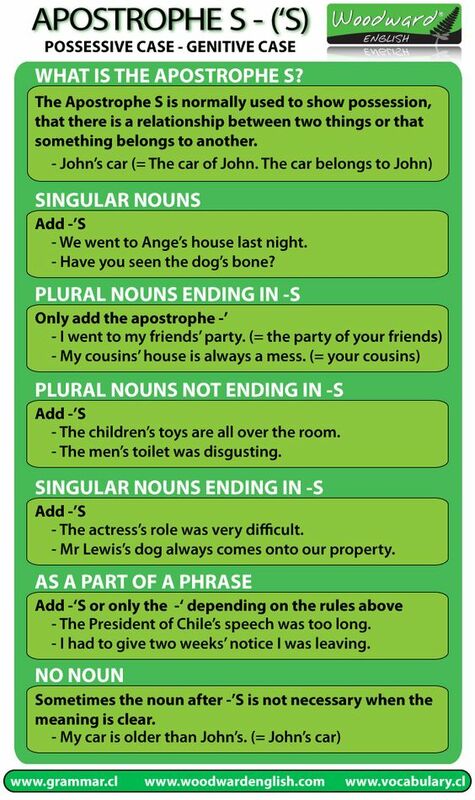 They end in an apostrophe (s’) when the word ends with an -s or an apostrophe plus -s (‘s) when the plural word doesn’t end in an -s.
NOTE: Remember that possessive nouns are followed by what they possess. Double-check to see if you are meaning possession or simply trying to make a noun plural without it possessing anything. This week’s challenge is poetry! Write a sticky-note poem (a poem written on a sticky note) OR a 55-word story that makes correct use of the apostrophe rules. Then, share your poem or story in the comments section below or on social media (and link it back to this post). You’ve got this! Next time (May 17th), we’ll be looking at the lovely difference between who and whom! Looking forward to the who vs. whom grammar lesson. I screw it up all the time. Never understood how to test for correct usage. I hope it helps you tomorrow! Thanks for commenting!